Hardscape cracks – Paved surfaces like driveways, walks and patios may have cracked concrete and popped up paving stones. Pavers and stones can easily be re-leveled, but concrete may need to be patched or replaced. If you are replacing a driveway or walkway, consider using concrete pavers, which are easy to shovel and to repair after winter. And if you’ve had it with the snow blower, invest in a snow-melting radiant heat system under your paving — works for concrete, brick, and pavers! Frost heaving – Newly-installed plants can heave out of the ground if left unmulched, so make sure to replant these to their correct depth as soon as the ground can be worked. Water regularly to compensate for root loss due to exposure. Salt damage – De-icing salts from roads and walkways burn the leaves and needles of nearby evergreens. Prune out any serious damage, and provide extra water to these plants in spring, as salt accumulated in the root zones may cause ongoing dehydration. 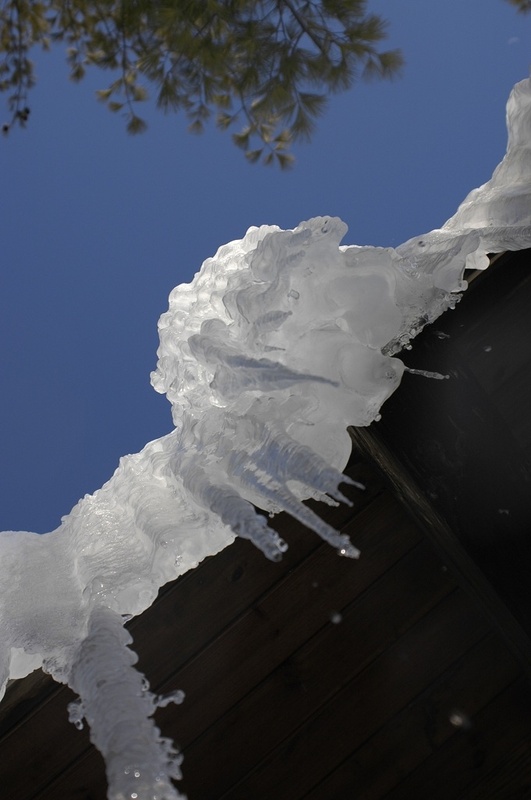 Broken branches – Heavy snow from roofs and shoveling damaged many shrubs and even the lower branches of small trees. Prune broken branches back to the nearest branch union, making it easier for plants to recover. Winter burn – Unless covered by a protective layer of snow, evergreen plants such as rhododendrons and boxwoods can be damaged by cold, dry winter winds. Often, leaves die while the branch remains viable, so observe plants for new growth, then prune out any dead branches. Lawn damage – Lawns and plant roots were well-insulated by the snow, which should minimize cold damage. However, the snow made a nice burrow for voles and other small mammals, leaving holes in lawns and nibbling the bases of woody plants. Edges of lawns may also have been harmed by salt and plow trucks. Plan to rake out clumps, add compost, and reseed bare areas in spring, but wait for late summer for complete lawn renovations. Weeds – Moist conditions from melting snow combines with warming spring temperatures are going to create perfect germination conditions for weed seeds, so consider applying an organic preemergent such as corn gluten to minimize the number of weeds in the lawn. Mowing high and overseeding regularly are also important to inhibit weeds. Insects – The extreme cold may reduce hemlock wooly adelgid, but will not have a significant impact on winter moth, so schedule treatments as normal for maples, crab apples, and other favorite foods of winter moth caterpillars. Also, ticks thrive after winters of heavy snow, so use good gardening practices to keep ticks out of the yard, and begin checking yourself and your children as soon as snow melts and temperatures are above freezing. 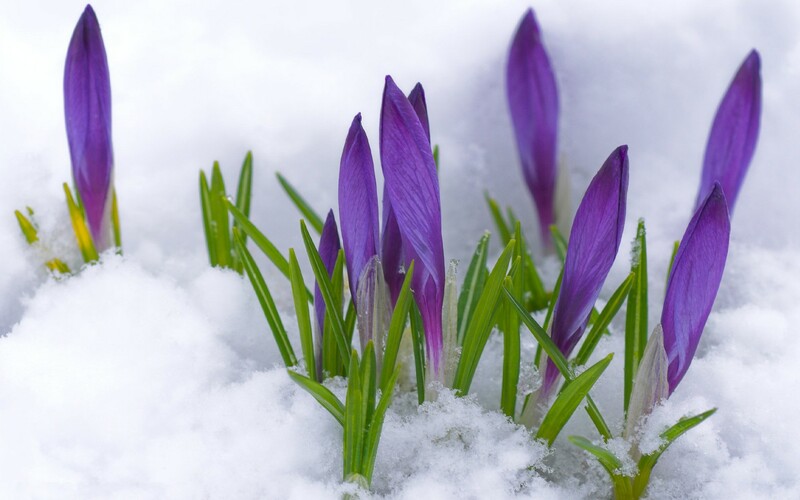 Bulbs & Perennials – Friends have asked, “Will my spring bulbs still bloom when they’re covered by 2′ of snow?” Yes! Bulbs respond to light and temperature, so even early bloomers like snowdrops and crocuses will stay “asleep” until uncovered and exposed to warmer spring air temperatures. Likewise, perennials will thrive after a winter well-insulated under the snow. Before new growth starts to emerge from the ground, cut back the messy crowns of grasses, coneflowers, and other plants that you may have left standing in fall to provide winter interest. It’s all just a mess! – Squashed plants, lumpy lawn, rubbish poking out of melting snow… We know. Breathe. A proper spring clean-up, some grass seed and a fresh coat of mulch are going to make everything look 100% better. Add some pots of pansies and narcissus, and you’ll be ready for spring! When winter temps drop below 0, Boston-area gardeners may need to exercise special care to protect plants. As average temperatures have warmed in recent years, the USDA has shifted its plant hardiness zones, so that much of eastern Massachusetts now falls within zone 6b, where it was 6a in the 1990 edition. In layperson’s terms, this means that many of the “hardy” zone 6 plants sold by local nurseries may only tolerate an average winter low temperature of -5 to 0 degrees. In addition to marginally hardy plants, newly-planted material may have tender growth that is more open to damage. If you have any of the above, particularly planted in an exposed or north-facing spot, take steps to protect them to prevent casualties. Damage may include bud loss, stem and twig die-back, or even complete death. Snow will provide some protection to the root zone, but you may also consider applying 4-6″ of mulch over the root zone. More importantly, wrap above-ground parts with floating row covers, burlap, or light blankets (not comforters or plastic! ), secured against wind using bricks or large stones. Old-fashioned incandescent lights can also add heat around branches. Remember that plants in containers are two full zones more susceptible to cold, so unless you have planted things for zone 4 and below, insulate pots or bring them indoors. Wrap pots with bubble wrap, blankets, or haybales, group plants along heat-reflective patios or walls, and cover exposed soil with evergreen boughs. After temps warm, hold off on pruning branches that appear dead. Pruning too long before plants “wake up” in spring may invite further damage. Your landscape professional can help asses the extend of damage in late winter/early spring, to avoid removing more of the plant than necessary. Last winter, rapid accumulation of heavy snows damaged many flat roofs. If your house has a flat roof, make sure that you purchase a roof rake ahead of time, or contract with a snow removal company that offers roof clearing services. Disconnect and drain any rain barrels to prevent freezing and cracking. The empty barrels can be very lightweight, so make sure that they are secured so they don’t blow away in heavy winds. Inspect and clean the gutters and drainage systems. If you have a basement sump pump that drains into a dry well or exterior drainage system, it should have an overflow in case the system freezes up. Before the ground freezes, check the grading of soil around house foundations and behind retaining walls. When heavy spring rains come, you want the water to flow away from your house, and not to get trapped in a low point behind a wall. Inspect trees for cracked, dead, or broken branches that might damage your house or vehicles. Shut off water to outdoor faucets, then open the faucet so that any remaining water can drain out. Drain and store garden hoses and drip tubing. Have irrigation systems drained. Stock up on ice melt, selecting one that meets your family’s needs. Salt will damage concrete, so read labels carefully to select the appropriate product. Ice melt with magnesium chloride or magnesium acetate as the active ingredient will damage plants less than salt or calcium chloride, though chloride can accumulate in soils and water supplies, and damage plants over time. Chlorides will also irritate pets’ paws and stomachs. Shift seasons for your maintenance equipment. Drain gas from the lawn mower. Fuel up the snow-blower, add oil, and check rotor blades, belts, and spark plug. Put away gardening tools, and have snow shovels at hand. Our crews are available to help with your winter preparations. Drop us a line to schedule a free estimate. For background on this meditation, go here. You are a tender plant, all soft, green stems and leaves. As the days grow shorter, you send all of the nourishment collected from the summer sun down into your roots, and you prepare to wait. Your leaves yellow and crisp, until the Gardener chops them back. You are sad without your leaves. Then, you realize that they were dead anyway. What had kept you alive no longer serves you. You let your once-beautiful leaves go. The Gardener comes back and tucks you in with a blanket of straw. You nestle your roots down into the soft earth, grateful for shelter from the cold, harsh, scouring winds. You sit in the darkness. You wait. Some days, you dream of pushing your shoots up through the soil. You hunger to feel the sun on your face, to feel your flowers opening, your seeds ripening. But you know that to spring forth now would be unsustainable. To burst out in abundance now would deplete the stores you worked hard all summer to nurture. So for now, you rest. You dream. You sit. You dwell in your own Be-ing, grateful for the protection of the dark earth. You trust in the Gardener who sheltered you with straw, and who will keep the rabbits from your tender, new leaves when spring returns. You don’t have to do anything to bring the spring. It will come. The Gardener loves you, and she will come, too. So, for now, for winter, you rest and you dream. Some days, you dream of summer, and it makes you sad for what is lost. Some days, you dream of spring, and feel lonely without the robin and the worms. Then, you remember that it is winter, not spring or summer. And winter cannot be rushed. Only when the earth turns back to the sun will it be your time to stretch forth into the open air once again. But you remember that, after your long rest, after months of nearly imperceptible changes within you, a time will come when you are ready to unfurl your leaves and bloom once again. Across cultures and religions, residents of the northern hemisphere have struggled to make meaning of these final weeks before the winter solstice — weeks of cold and darkness before the days start to lengthen again. The seasons of Chanukah and Advent/Christmas both contain symbols of this progression from darkness into light. Whether we are religious, spiritual, or simply aware of the movements of nature, this time is an opportunity to reflect on the role of darkness, stillness, quiet, and waiting in our own lives, as symbolized by the plant world around us. Carolyn Edsell-Vetter is a former student of comparative religion and M.Div.-turned-horticulturist. She usually blogs on the more mundane topics of sustainable design and organic landcare. Carolyn wrote this meditation as part of a Shabbat service she led during the lead up to Chanukah. Photos are by her husband, Jesse. More about him at JEVPhotography. Our crew finished installing holiday lighting last week at this residential property near Copley Square in Boston. Sketch: Develop a plan on paper before you begin. Together with “after” photos, this will simplify your work next year! Hang: Give yourself several hours of daylight, to avoid frustration or errors from rushing. Investigate: Inspect all extension cords, and test each string of holiday lights while you’re still on the ground. No Shortcuts: Use only lights and decorations labeled for outdoor use. Follow your wiring plan and avoid the temptation to overload circuits. Encase: Tape up connections with electrical tape to protect them from the elements. Only use clips: No staples or nails. Never go solo: Use the buddy system whenever using a ladder. Your lighting plan should include not only the desired lighting effects, but how you will wire them with the available outlets. Also consider how lights will be controlled. Do you want to have to go outside in your bathrobe at midnight to shut off the system? If not, consider an outdoor-rated digital timer, photocell, or wiring onto an indoor switch. Controllers will help you to save energy, but so will choosing LED fixtures. While the upfront cost can be a bit more, LEDs consume up to 90% less energy than incandescent lamps, and last up to seven times longer. That’s a lot of years of happy light-bulb testing! While consumer-grade products may not be as durable as professional-grade lighting, you will get the best performance from reputable vendors and manufacturers. Look for UL and EnergyStar labels. Sound too complicated, cold, or time-consuming? Contact A Yard & A Half for dazzling holiday lighting. 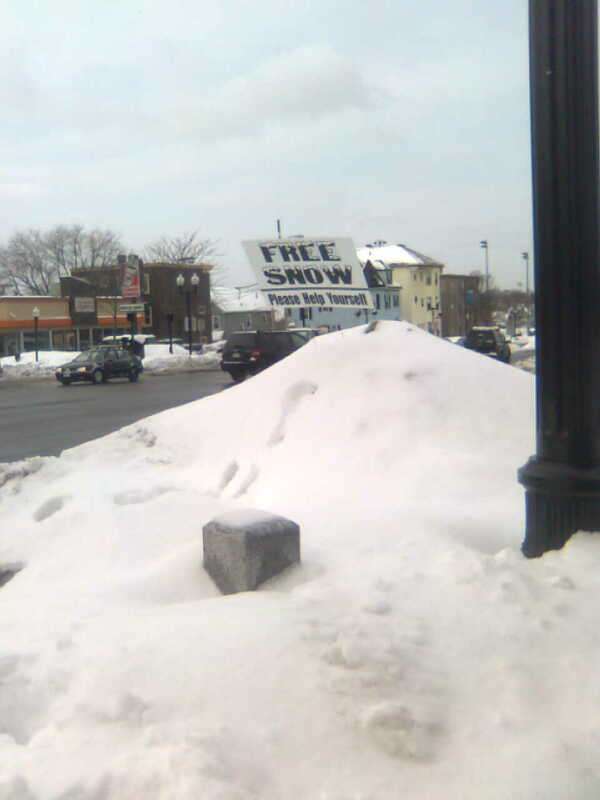 My neighborhood sign shop has a little fun with the weather. We’ve had a few good days of thawing, but February is usually Boston’s snowiest month, so it’s not too late for a snow post. The good news: Snow is a great insulator for plants. We see a lot more winter kill in cold, dry winters than in heavy snow years. Hopefully, hydrangea macrophylla, container plants, and marginally hardy perennials will give a good showing in spring. The bad news: the weight of snow can damage and even break woody plants. Use a broom to knock heavy snow off brittle branches, particularly on upright evergreens like arborvitaes. Trees and shrubs which have dense branching (e.g. dwarf cultivars of Japanese Maple) or have not been pruned recently may also be in danger because they hold more snow. Also, if you have snow accumulating on a flat or shallowly-sloped roof, here are snow removal tips from the Massachusetts office of Public Safety. Stay safe and warm, and enjoy the white stuff! Snowshoeing last weekend in the Middlesex Fells. Join me for Gardening in Small Spaces: Living densely has many benefits, but may come at the price of growing our own food or relaxing outdoors. Yet, we can nourish our bodies and souls using space afforded by a roof deck, patio, or small yard. Learn about small space design, edibles for containers, and vertical gardening, plus small-scale bioshelters, composting, and rainwater harvesting. 50 workshops on organic farming, gardening, landscaping, and sustainable living. Lively exhibit area, NOFA/Mass Annual Meeting, great children and teens program, potluck lunch!